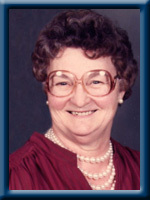 PARKS – Melba Rachel, 89, of East Port Medway, Queens County, passed away peacefully in her sleep at Heart of the Valley Nursing Home, Middleton on July 24th, 2011..
Born in Vogler’s Cove on October 15th, 1921, she was a daughter of the late Alfred and Lelia (Conrad) Conrad. Melba was a lifelong resident of East Port Medway and a member of Wesley United Church where she served as organist for 50 years. She was also a member of the U.C.W. Melba enjoyed knitting and especially baking. Many a friend who visited her home was a recipient of her special “care package”. She is survived by her daughters Myrna (Ronald) Smith of Lower Sackville and Patricia (Holger) Schlierenkamp of Bochum, Germany and her son G. Murray (Shirley Corkum) of East Port Medway. Six Grandchildren and 2 great grandchildren. Her sisters: Lorinda Reinhardt of Shoreham Village, Chester and Sylvia Fyffe of Ottawa. She was predeceased by her husband George, grandson Justin, her sisters Olive McKinnon and Vivian Hill and her brother Wheldon. No visitation by request. A graveside funeral service will be held Thursday, July 28th, 2011 at 11:00 a.m. in East Port Medway Community Cemetery. Lay minister Peter Anthony officiating. No flowers by request. Donations may be made to the Alzheimer Society of Nova Scotia or the Canadian Cancer Society. Online condolences may be made to www.chandlersfuneral.com. Murray and Family: Sorry to hear of your mother’s passing. She is now at peace and soaring with the angels. So sorry to hear of your Mom’s passing, Murray. Our thoughts are with you. Gary & Heather Crossland Clearland N,S. sorry to hear of melba’s passing may she rest in peace. So sorry for your loss, Murray. You are in my thoughts and prayers. Condolences to the entire family from an old friend and neighbor, Audrey Scully. She was a great individual and I really liked her and George and always enjoyed their company, as did my late husband Harry Scully. MURRAY AND FAMILY.SO SORRY TO HEAR OF MELBAS PASSING.MAY SHE REST IN PEACE.OUR THOUGHTS ARE WITH YOU AT THIS SAD TIME.MAXINE TONY. a beautiful picture of your mom.That’s how I remember her from when she babysat me for my preschool years, & later from my greatest visits we enjoyed together. I was one of the fortunate ones who received her “care packages”. She will always be in my memories ,my second “mom” . May she now find comfort in being with your father, whom she adored. Love & hugs to you at this time,we are thinking of you. Murray and family …so sorry to hear about Melba’s passing our deepest sympathy go out to you at this most difficult and sad time. George sorry to hear about the loss of your mother. Thinking of you at this sad time. I know how much you loved your mother. You were a such a great suppport to her, as you were to me when my mother passed away. wishing you all the best at this difficult time. Murray, we were sorry sorry to hear of your moms’ passing. We feel privledged to have know her and been her friend. She said Holley was “her” bionic man and had a great laugh. I will remember her happy smile and love of music. Our deepest regrets to you & family . May she rest in peace. I will always remember my Dear Friend and neighbour, Melba Parks. She was such a very kind person who was always there for you ,no matter what the day offered. Her smile, love, hugs and her generous giving of the finest baked goods, homemade bread etc. She taught us all so very much. How she loved and took care of my children when I had to be in Halifax with my sick husband. Glenn & Norma had never seen so much food in their lunches for school. God Bless You Melba. You were one of a kind. My condolences to Myrna, Patricia and Murray, and families. Myrna, Patricia, Murray and families. Sorry to hear of the Passing your mother. I have fond memories of her as one of the most friendly and accomidating mothers in the neighbourhood, Some of my memories include going to the beach at Green Bay for a Sundayschool picnic and of course chocolate cake. She was a special lady. So sorry to hear of your Mom’s passing. My memories go back to the many times that we visited with your Mom and Dad when we visited Nova Scotia.We always had to come for a meal and I must say some very good meals. I will always have fond memories. We enjoyed singing around the organ and also going to church with them a couple times when we were there. We were there for their wedding anniversary party. I think it was their 50th. They were such good people and I count it a priviledge to have know them as well as be related to them. In case you do not know who I am, I am Crawford’ Conrad’s daughter, from Ohio. So sorry to hear of your Mom’s passing. She was a lovely lady. Leo still has the socks she knit him! Love and hugs to the family. Murray and Family. Our sincere sympathy for the loss of your Mom. Sincere sympathy for the loss of your mom. She was certainly a wonderful person & next door neighbour too. Melba was always happy & we always went home with a hug & some of her baked goodies. (banana fruit bread, rolls,cookies) I will always have fond memories of both her & George, as they were both special to us. I loved to see Melba at WA and all the social get togethers in E.Port when I was growing up. A truly good hearted woman with a wonderful sense of humour. She was a very good baker and I remember having raised donuts there when I visited one time,the best I ever had or will ever have. Melba always had beautiful nails in bright colours and took pride in her appearance. I sometimes think of all the ladies of E.Port now gone, they were good people always there if you needed them, the door open and a snack even if you weren’t hungry. She must have been a very loving Mom and Grandma while she was able. Take care. So sorry for your loss. I remember visiting Melba with my grandmother, Margarete.Melba was always smiling and always had an array of home baked goodies to share with guests.She was a great supporter of the church and community. I’m sure she will be missed and fondly remembered. My thoughts and prayers to the family-Melba was a dear neighbor and a wonderful lady. She was like a grandmother to me when I was growing up in East Port Medway-she will always be forever etched in my memories of childhood. Melba was more than just a great neighbour, she treated us as family. My travels have taken me thousands of miles away to the Middle East, but East Port Medway is always close in my mind. Rest in Peace Melba. I will always remember my lovely and vivacious Aunt Melba. Visiting her and my Uncle George was an adventure. Her kitchen was a constant hub of activity, and she always took an interest in what we were up to. My sincere condolences to Myrna, Ronnie, Murray, and Patricia and my Aunt Lorinda. God Bless. My sincere condolences on the passing of your mother. Roger and I have such wonderful memories of our trip to the East coast and our visit with Melba, Murray and Lorinda. I have also lovely memories of summers spent at the farm house when I was younger and what a lot of laughter there was. Melba was such a warm and happy person and that is how I will remember her.